The sign of a good Turkish coffee is that it must have a face. It's a weird expression I know, but it refers to the thick light-colored layer sitting on top of the black coffee in the cup. There are three techniques that combine to help make the perfect cup of Turkish coffee. First off, the water must be cold. Secondly, the coffee is not to be stirred at any stage whatsoever. And thirdly, low heat is key. Turkish coffee is usually strong and bitter, so people like to either sweeten the coffee itself or drink it with a sweet bite. The cup used is the size of a demitasse: it's not an espresso, nor is it an americano. *1 Turkish coffee cup is about the size of a demitasse cup. In the dallah, put the cold measured water, and spoon the coffee and sugar over the top. Do not stir at all, just leave the coffee sitting on the water. Put the dallah over medium heat for 3 minutes, then reduce heat to low and watch closely for another 5 to 7 minutes. It will want to start to boil but you must remove it just before the boiling bubble breaks. If the coffee boils it will lose its face and that's a sign of a failed Turkish coffee. 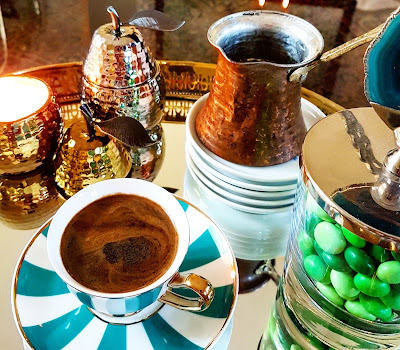 Pour delicately in a thin stream into the turkish coffee cup and serve alongside something sweet (usually dates) and a glass of water. Assalama alaikoum Maryam. This is the only coffee that I am not allergic too and I just lobe drinking it. I have seen it made 1000 times by Turkish, Persian and Arab friends, yet when I try to make it, it never ever comes out right. I was contemplating getting a Turkish Coffee maker machine. But I will try your instructions and inshallah it will come out right. Wa alaikum al Salam ukhti, you're most welcome. I hope it works out well for you. Do let me know!